The West Coast Main Line (WCML) is one of the most important intercity railway lines in the United Kingdom, part of the British railway system. The line links London with Glasgow on a 401-mile route which runs via the West Midlands, the North West and southern Scotland. The WCML also serves other important towns and cities including Milton Keynes, Northampton, Rugby, Nuneaton, Coventry, Birmingham, Wolverhampton, Tamworth, Stafford, Stoke-on-Trent, Macclesfield, Crewe, Warrington, Wigan, Stockport, Manchester, Liverpool, Bolton, Preston, Lancaster, Carlisle and Edinburgh. The line was built in stages between the 1830s and the 1870s, with the first stages being the Grand Junction Railway (Warrington - Birmingham) and the London and Birmingham Railway, both completed in the 1830s. These lines together with the Liverpool and Manchester Railway, the North Union Railway and the Manchester and Birmingham Railway amalgamated in 1846 to form the London and North Western Railway (LNWR). North of Carlisle, the Caledonian Railway remained independent and opened its mainline to Beattock in September 1847, to Edinburgh in February 1848 and to Glasgow in November 1849. One important section, the North Staffordshire Railway, which opened its line in 1848 from Macclesfield (connecting with the LNWR from Manchester) via Stoke-on-Trent to Norton Bridge and Colwich, also remained independent until the forced amalgamations of 1922. Partly to appease the concerns and anger of landowners along the route, in places the line was built so that it avoided large estates and rural towns, but also to reduce construction costs the line in places followed natural contours, resulting in many curves and bends. The WCML also passes through some of the more hilly areas of the British mainland, such as the Chilterns (Tring cutting), the Watford Gap and Northampton uplands followed by the Trent Valley, the mountains of Cumbria with a summit at Shap and the Beattock summit in the Leadhills area of southern Lanarkshire. This has left a legacy of lower maximum speeds on the line compared to the East Coast Main Line (ECML) route, and the principal solution to the problem has been the adoption of tilting trains, formerly British Rail's ill-fated APT, and latterly the Class 390 Pendolino trains introduced by Virgin in 2003. The route to Scotland was marketed by the LNWR as 'The Premier Line' but operations were complicated by incompatible braking systems since the LNWR used the vacuum brake and the Caledonian used the Westinghouse air brake. Through trains were therefore of necessity composed of dual braked and jointly owned "West Coast Joint Stock" (so named). Following amalgamation, in 1922, it became part of the London, Midland and Scottish Railway (LMS) and the vacuum brake quickly became standard. In 1947, following nationalisation, it came under control of British Railways London Midland and Scottish Regions, when the term "West Coast Main Line" officially came into use, although the term is something of a misnomer given that the line only runs along the coast on a brief section overlooking Morecambe Bay just north of Lancaster. The WCML is not a single railway; rather it can be thought of as a network of routes which diverge and rejoin the central core which runs between London Euston and Glasgow Central. The route from Rugby to Birmingham, Wolverhampton and Stafford was the original main line until the shorter line was built via the Trent Valley. There is a loop that serves Northampton and a branch north of Crewe to Liverpool. This is notable since Weaver Junction on this branch is the oldest flyover type junction in use. The WCML includes loops that branch off to serve Manchester, one from Colwich Junction in the Trent Valley south of Stafford via Stoke-on-Trent, one north of Stafford also via Stoke-on-Trent and one via Crewe and Wilmslow. The Windsor Link north-south junction line in Manchester constructed by British Rail in 1988 has made possible a through service via Bolton back to the main line at Preston. A further branch at Carstairs links Edinburgh to the WCML, giving it a direct connection to the East Coast route. The line was modernised and electrified in stages between 1959 and 1974 - initial electrification was in 1959 between Crewe and Manchester and Liverpool, with the rest of the southern section of the line following in stages to 1967; the line from Weaver Junction (where the route to Liverpool diverges) to Glasgow was electrified in 1974. This era was notable for time-consuming and congestion-causing routine changes from at first steam and later diesel to electric traction at busy change-over stations like Birmingham New Street, Crewe and Preston. A policy of "no diesels under the wires" was taken to extremes; at one time excursions from South Wales to Blackpool had to change to electric traction at Crewe and back to diesel at Preston. Electrification did not arrive on the short Carstairs Junction - Edinburgh Waverley branch until 1989, since this was at the time considered part of the ECML. Only the Preston - Manchester via Bolton, and Chester - Holyhead branches remain unelectrified. Modernisation culminated in the adoption of air brakes for locomotive hauled express trains. 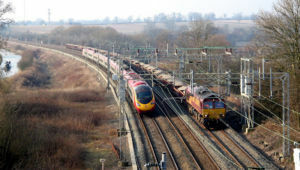 Also under British Rail, freight train operations and practices changed drastically resulting in the virtual elimination of the traditional slow moving and generally unbraked pick-up goods train and the introduction of faster moving point to point train load operations using air braked vehicles. The running of express passenger services on the WCML came under the InterCity brand in the late 1970s, which prior to privatisation in 1996 was known as "InterCity West Coast". "InterCity CrossCountry" with its hub at Birmingham was also greatly developed with the introduction of transferred HST units following the electrification of the ECML. Following privatisation, the principal operator on the line has been Virgin Trains who operate all long-distance express services, but many regional operators along the route also run local commuter sevices. Modernisation brought great improvements, not least in speed and frequency, to many WCML services but there have been some losses over the years. Locations and lines served by through trains or through coaches from London in 1947 but no longer so served include: Windermere; Barrow-in-Furness, Whitehaven and Workington; Huddersfield and Halifax (via Stockport); Blackpool; Colne (via Stockport); Morecambe and Heysham; Southport (via Edge Hill); and Stranraer Harbour. Notable also is the loss of the through service from Liverpool to Scotland. The WCML is currently nearing completion of a major upgrade along almost its entire length. The original plans drawn up by Railtrack estimated that this upgrade would cost £2bn, be ready by 2005, and cut journey times London to Birmingham to 1hr (currently 1hr 40mins) and 1hr 45mins London to Manchester. This would be achieved through increasing the line speed to 225 km/h (140 mph), in place of the previous maximum of 175 km/h (110 mph). However the plan was doomed from the beginning, since Railtrack had not assessed the technical viability of "moving block signalling" (see the Railway Signalling page for more details) prior to promising the speed increase to Virgin and the Government. No-one had attempted to implement moving block on a line as complex as the WCML anywhere in the world, and it soon became apparent to engineers that the technology was not mature enough to be used on the line. The bankruptcy of Railtrack in 2001 following the Hatfield crash brought a reappraisal of the plans whilst the original cost of the upgrade soared. Despite early fears that the cost overruns on the project would push the final price tag to £13bn, reappraisal of the plans has brought the cost down to between £8bn and £10bn, ready by 2008 with a maximum speed for tilting trains of a more modest 200 km/h (125 mph). Services from Liverpool to the South West and the South Coast were withdrawn by Virgin in September 2003. 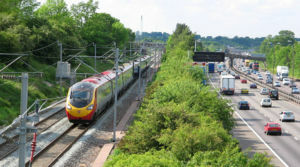 The first phase of the upgrade, south of Manchester, opened on 27 September 2004 with London to Birmingham journey times of 1hr 21mins and London to Manchester 2 hours 6 minutes. The final phase was announced as opening on December 12, 2005, bringing the journey from London to Glasgow to about 4½ hours,  although considerable work such as the quadrupling of the track in the Trent Valley (in progress and moving towards completion under budget), upgrading the slow lines, the second phase of remodelling Nuneaton, and the remodelling of Stafford, Rugby, Milton Keynes and Coventry stations are mostly now progressing. The upgrading of the Crewe to Manchester line via Wilmslow is nearing completion in Summer 2006. Engineering work began again in late 2005 between Preston and Carlisle. This affected a number of stations; Lancaster, Oxenholme Lake District, and Penrith. Train services run as normal from Monday to Friday, with a replacement bus service at the weekend between Preston to Carlisle, calling at all the affected stations. From April 2006, train services at the weekend were no longer terminated at Preston, and continued to Oxenholme Lake District where Virgin Trains terminated and this became the starting point for southbound services. The Oxenholme to Carlisle section of line is due to reopen at weekends during the summer of 2006. New trains for the route include 53 nine-car Class 390 Pendolino trains and initially 30 four-car Class 350 Desiro electric trains for Silverlink/Central Trains (with more anticipated) as well as Virgin Voyager and Super-Voyager trains for the cross-country services. Pendolino 2005 off-peak frequency of six trains per hour (rising to ten in the morning peak) is planned to increase to nine off-peak by 2009 including three per hour to both Birmingham and Manchester plus an hourly tilting Voyager service to Chester as well as improved services to Liverpool, Preston and Scotland. There will also be an hourly Desiro operation from London to Crewe serving Watford, Milton Keynes, Northampton, Rugby, Nuneaton, Atherstone, Tamworth, Lichfield, Rugeley, Stafford and Crewe. Virgin Trains recently put forward plans to increase the line speed in places on the WCML and particularly on sections of the Trent Valley Line between Stafford and Rugby from 125 mph to 135 mph after the quadrupling of track had been completed. This would permit faster services and possibly allow additional train paths. 135 mph is claimed to be achievable by Pendolino trains while using existing signalling systems without the need for a cab signalling system. Network Rail are studying this proposal. In promoting the above proposal Virgin Trains report that passenger numbers on Virgin West Coast have increased from 13.6 million in 1997/98 to 18.7 million in 2005/6, while numbers on Virgin CrossCountry have grown from 12.6 million to 20.4 million over the same period. In September 2006, a new speed record was set on the WCML - a Pendolino train completed the 401-mile Glasgow Central - London Euston run in a record 3 hours 55 minues, beating the APT's record of 4 hours 15 minutes, although the APT still holds the overall record on the northbound run. In January 2007 significant engineering work is forcing the closure of one line between Milton Keynes and Euston meaning journey times from Manchester on a Saturday evening are currently around 4 hours. Network Rail, successor from 2001 to Railtrack plc, in its latest business plan published in April 2006, has divided its National network into 26 'Routes' for planning, maintenance and operational purposes. Although Route 18 is named 'West Coast Main Line', it differs from the classical definition of the WCML as the route between London Euston and Glasgow Central in that it includes several branch lines that had not previously been considered part of the WCML. Likewise several lines that have traditionally been seen as parts of the WCML, including all the northern terminal sections of the WCML, are incorporated in other 'Routes'. The cities and towns served by the WCML are listed in the tables below. Stations on loops and branches are marked ** Those stations in italics are not served by main-line services run by Virgin Trains but only by local trains. Between Euston and Watford Junction the WCML is largely but not exactly parallelled by the operationally independent Watford DC Line with 17 intermediate stations, including three with additional platforms on the WCML. The North Wales Coast Line from Crewe to Holyhead and the line from Manchester to Preston are not electrified. Services from London to Holyhead and from Manchester to Scotland are mostly operated either by Virgin Super Voyager tilting diesel trains or, in the case of one of the Holyhead services, by a Pendolino set hauled from Crewe by a diesel locomotive. 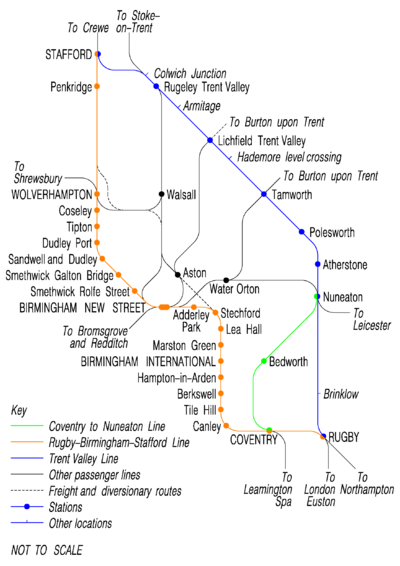 Map of the Rugby-Birmingham-Stafford line and other local routes. This page was last edited on 10 November 2011, at 21:31.